March 4, 2017 -- VIENNA - The European Congress of Radiology in recent years has come into its own as a showcase for new launches of medical imaging products. ECR 2017 was no exception, with a variety of new scanner debuts in MRI, CT, and other modalities. ECR for years languished in the shadow of the larger RSNA meeting in Chicago, but apparently no more. Not only has ECR 2017 seen the launch of products designed specifically for the European market, but it also witnessed the global launch of a new MRI scanner by Siemens Healthineers and a new MRI contrast agent by GE Healthcare. Following are some of the product highlights at ECR 2017 from the four major multimodality OEMs: Siemens, GE, Philips Healthcare, and Toshiba Medical Systems. 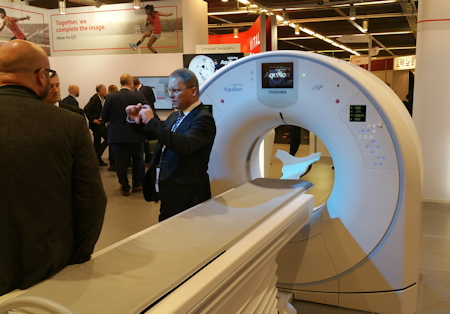 Magnetom Vida is a new 3-tesla MRI platform that Siemens launched just days before ECR 2017 convened. The system includes a number of advances designed to make MRI scanning more flexible and adaptable to patients, thereby speeding workflow. Key among the advances on Vida is BioMatrix, a new Siemens technology that addresses issues in patient variability such as obesity and respiratory difficulties that can make MRI more challenging. For example, BioMatrix Sensors are embedded in Vida's table to monitor patients' breathing and their ability to hold their breath during a scan. Data from the sensors are fed into the system to help users pick the best scanning protocol. Another BioMatrix technology is BioMatrix Tuners, which use what Siemens calls "intelligent" radiofrequency (RF) coil technology to automatically set optimal scan parameters based on the anatomy of individual patients, thus avoiding rescans. And BioMatrix Interfaces can accelerate the scanning process by up to 30% by enabling automated patient positioning using intelligent body models that automatically move the patient table to the correct scan position. 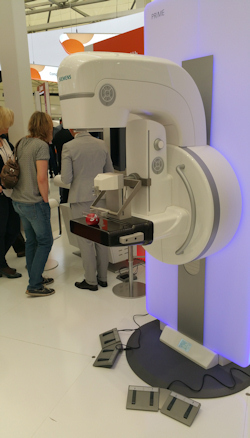 Other new features on Magnetom Vida include a touchscreen user interface embedded on the scanner and a motorized table that enables even the most petite radiographers to move and position the heaviest patients. Technical specifications of the system include its 60/200 XT gradient system, rated at an amplitude of 60 millitesla/meter and a slew rate of 200 tesla/meter/second that provides more than 2.7 megawatts of power on a system with a 70-cm bore scanner. Siemens is also highlighting Vida's field-of-view, at 55 x 55 x 50 cm. Siemens believes that shipments of Vida will begin in the summer in selected geographies following the receipt of regulatory clearances. The company has submitted a 510(k) clearance with the U.S. Food and Drug Administration (FDA). In breast imaging, the company is highlighting its wide-angle digital breast tomosynthesis technology for the Mammomat Inspiration system, in which 25 mammography images are acquired across an arc of 50°. Siemens believes that the wider angle produces images with better resolution than tomo studies acquired using fewer images across a narrower arc. Siemens has a new data reconstruction algorithm called Insight 3D for wide-angle tomosynthesis that began shipping recently in Europe. 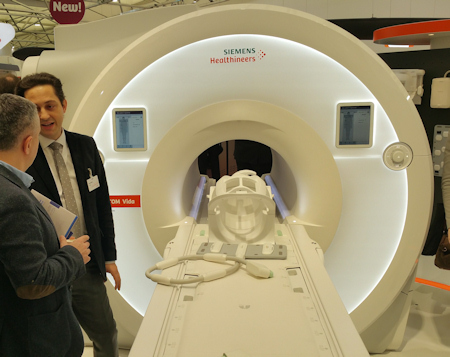 Other Siemens highlights at ECR 2017 include systems launched at previous meetings, such as the Magnetom Sempra MRI scanner for cost-effective imaging at 1.5 tesla, the Compressed Sensing MRI scanning protocol, and the Artis pheno angiography system. GE's major ECR news is the launch of Clariscan, a new macrocyclic MRI contrast agent. The gadolinium-based contrast agent (GBCA) is designed to visualize abnormalities in the brain, spine, and associated tissues. Clariscan is macrocyclic and ionic and is based on gadoteric acid. It will be available in a range of doses in vials and prefilled syringes. It joins the company's linear GBCA Omniscan, which has been used for MR imaging for more than 25 years. Thus far, Clariscan has received approval for marketing and distribution in Norway. GE plans to introduce the new contrast agent to the rest of Europe this year on a country-by-country basis. 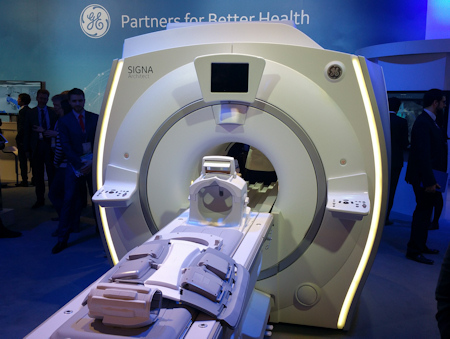 Also in MRI, GE is highlighting Signa Architect, a 3-tesla system shown at RSNA 2016. The wide-bore scanner is supported by 96- and 128-channel RF coil designs. Signa Architect also features a work-in-progress 48-channel head coil that supports applications such as video goggles for functional MRI exams and includes a design compatible with electroencephalograms for advanced neuroimaging. Signa Architect is a new 3-tesla MRI scanner. In CT, Revolution ACT is a new scanner that the company is launching in Europe after selling the system in Asia and South America for the past two years. It is available in 16- or 32-slice configurations and is designed to be an economical scanner that can also perform advanced applications. Revolution ACT shares a user interface with GE's flagship Revolution scanner, with the Clarity detector panel technology in which detector modules can be swapped in and out, which is easier than requiring an entire detector array to be replaced. The scanner is also compact and easy to service, and its power requirements are 47% lower. In fact, the system was designed for regions with unstable power supplies, the company said. GE's adaptive statistical iterative reconstruction (ASIR) algorithm is available on the system as well. Several Revolution ACT systems have been installed in Europe, while the company is performing a market assessment on whether to bring the system to the U.S. Some 700 units are installed in the rest of the world. Virtual reality (VR) is all the rage, and GE has dedicated a section of its ECR booth to a demonstration of the technology. ECR attendees can put on VR goggles that immerse them in a virtual scanner suite where they can manipulate objects and interrogate data. GE believes virtual reality has potential as a tool for clinical collaboration on complex cases or for education. Stay tuned for further developments. GE is also discussing 3D printing, demonstrating how reports from one of its AW workstations can be exported to stereolithography (STL) files, which are then used to print 3D models. 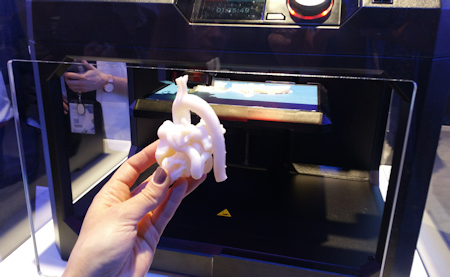 GE is showing work in 3D printing in its ECR booth. Capturing the spotlight in the Philips booth at this year's ECR 2017 meeting is Azurion, a new interventional angiography system that the company launched just the week before the congress opened. Philips has positioned Azurion as its flagship platform for image-guided therapy, which includes hardware and software improvements designed to enable clinicians to more efficiently perform complex interventional procedures. The system features upgrades to the angiography technology found on the company's previous platform, the Allura and Allura Clarity systems: It uses a more modern C-arm design, with new flat-panel digital detectors and a new version of the Philips MRC x-ray tube. Philips has also streamlined the system's user controls, with more controls packed into displays so fewer monitors are necessary. 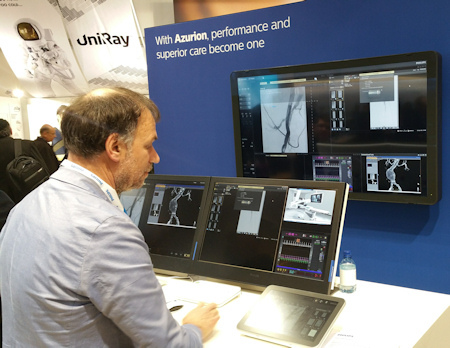 Philips is showing workflow advantages of its new Azurion angiography system. Philips also rewrote the operating software behind Azurion, coming up with a new operating system called ConnectOS that enables better integration of real-time information from all the technologies that might be found in an interventional lab or hybrid operating room, according to the company. Philips' advanced applications such as VesselNavigator for vascular surgery, EchoNavigator for interventional cardiology, EmboGuide for interventional oncology, and AneurysmFlow for interventional neuroradiology are also available on the system, as are radiation dose reduction features. Azurion has been in use at about 20 clinical sites around the world, and Philips has regulatory clearances for the system in most global markets. In ultrasound, Philips is discussing ElastQ Imaging, a new capability for its Epiq ultrasound scanners. The technique uses shear-wave elastography and contrast to enable simultaneous imaging of tissue and assessment of its stiffness for evaluating liver disease and avoiding biopsies. It can also be used for technically challenging patients. ElastQ uses the C5-1 PureWave curved-array transducer, which can operate from 1 to 5 MHz. 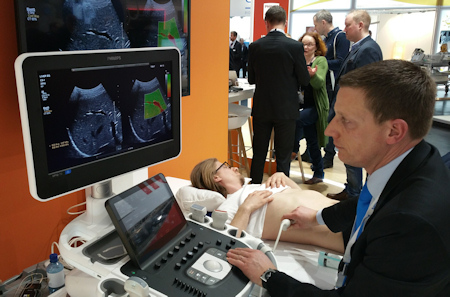 The technique enables one-button access to elastography with a 6 x 5-cm field-of-view and a 20-MHz frame rate, while a feature called Confidence Map enables sonographers to quickly determine their region of interest. ElastQ is also capable of performing elastography on retrospective exams, and a feature called MaxView enables users to expand the image to a 1,920 x 1,080-pixel matrix without a loss of resolution. In CT, Access CT is a new 16-slice scanner for cost-conscious hospitals. The system is designed to carry both a low price tag and low total cost of ownership, according to the company. The life of the system's x-ray tube is extended thanks to use of the company's fourth-generation iDose4 iterative reconstruction protocol, while iFlow helps radiographers ensure consistency in scanner operation. Philips plans to begin shipping Access next month; shipments to the rest of the world will follow. The ECR 2017 meeting marks the first congress at which Toshiba Medical Systems has exhibited following its acquisition by Canon in December 2016. In product news, Toshiba is reprising the launch of the Vantage Galan 3T system that it first debuted at RSNA 2016. The 3-tesla scanner is designed to offer high-quality images with a new level of patient comfort, and it incorporates new versions of Toshiba technologies that reduce noise during MRI scans while improving image quality. 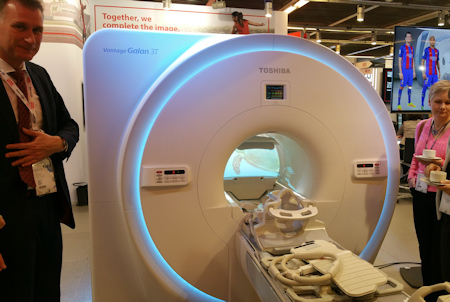 Toshiba is promoting its Galan 3T MRI scanner. For example, Galan 3T features the newest version of Pianissimo, Toshiba's MRI noise reduction technology. Called Pianissimo Zen, the technology reduced MRI scanning noise by 99.8% to ambient levels in trials of the system, according to the company. Toshiba is highlighting the scanner's 71-cm magnet bore, while Toshiba's PureRF radiofrequency coils and Saturn gradient technology work together to improve signal-to-noise ratio by 20%. Meanwhile, Toshiba's Easy Tech workflow makes patient positioning and scanning easier and its MR Theater patient entertainment system further reduces patient claustrophobia. Toshiba has four installations of Galan 3T operating in Europe, with one system installed in Spain, one in Germany, and two in Portugal. In interventional x-ray, Infinix-i Sky+ is Toshiba's flagship angiography system, which was also demonstrated at RSNA 2016. The system uses a new double-sliding C-arm design with 210° of anatomical coverage from any angle, according to the company. It also employs 12 x 16-inch flat-panel digital detectors, with high-speed 3D rotation of 80° per second. The angiography system can be combined with a CT scanner on rails for a configuration that Toshiba calls Infinix-i 4DCT, with the CT scanner intended to be used in situations where higher image quality is needed. One of the first Infinix-i 4DCT installations in Europe is at the Hospital Saint-Louis in Paris. In ultrasound, Toshiba is showing its new iBeam and xMatrix technology on i-Series, the newest upgrade platform for its Aplio 700 and 800 systems. The technology enables better image quality and more processing power, and it forms the foundation for advanced applications such as shear-wave elastography and contrast imaging. The i-Series platform is currently shipping. In CT, Aquilion Lightning SP is a new scanner targeted at the economy segment, completing Toshiba's product line in the midrange segment. The system is based on the company's Aquilion Prime system, with 4 cm of coverage per gantry rotation, compared with 16 cm of coverage on the flagship system. Lighting SP also has a smaller 5-megaheat-unit tube and 50-kW generator, and it includes Toshiba's adaptive iterative dose reduction (AIDR) 3D radiation dose reduction protocol. Toshiba completed the first installation of Lightning SP in October in Germany.